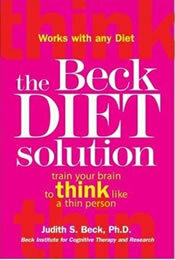 The Beck Diet Solution: Train Your Brain to Think Like a Thin Person is written by Dr. Judith Beck and is based on her extensive experience with patients who have lost weight through Cognitive Behavioral Therapy (CBT). CBT was developed by Beck’s father, Aaron, in the 1960’s as a technique to help dieters deal with the obstacles that they commonly experience while attempting weight loss such as yo-yo dieting, emotional eating, binging and negative thinking. Beck guides readers through a day-by-day process that involves decision making activities and practical exercises. Dieters are given a new task each day that helps build the psychological skills necessary to deal with the challenges of dieting such as cravings, overeating, stress, eating out, and vacations. On the first day of the program you are told to write down 15-20 reasons why you want to lose weight and this is to be read every day so as to maintain focus. Other exercises include practicing sitting down every time you eat, eating slowly, goal setting, writing lists of things to do, creating a social support structure, choosing a diet plan, and finding ways to counteract negative thinking. Each week there is one day that is set aside for dieters to ‘take a breather’. A great deal of emphasis is placed on preparation and dieters do not actually commence the diet plan until week three of the program. Beck offers no diet or exercise guidelines and she states that any healthy diet will be effective so long as dieters learn a different way of thinking about food and eating. Dieters choose any diet plan they like or they can create their own plan if they choose. Beck recommends that dieters set short term goals and suggests an initial weight loss goal of five pounds. In addition she recommends daily food journaling and weekly weigh ins so as to track progress and enhance awareness. The program is not concentrated on discovering the emotional reasons for overeating or dealing with deep psychological traumas but is more of a guide to deal with practical issues such eating out of boredom, fear of hunger and how to cope with cravings. Exercise is encouraged and dieters are told to engage in both planned exercise and spontaneous exercise where you take advantage of situations you find yourself in. For example taking the stairs rather than the elevator. These exercises can be used with the Beck Diet. The Beck Diet Solution retails at $24.95. There is also a workbook that retails for 16.95 and an audio CD for 24.95. Teaches dieters skills that will help with lifelong weight maintenance. May help to break the cycle of yo-yo dieting. Examines the reasons why people overeat. Good for dieters who overeat in response to stress, out of habit or boredom. Helps dieters tell the difference between true hunger and cravings. Food journaling and regular weigh-ins have both been associated with a greater chance of weight loss success. Encourages dieters to celebrate their success no matter how small. Reader can set the pace so that it suits them. Does not include a diet plan or nutritional guidelines. Does not teach dieters how to construct a nutritionally balanced meal plan. May not be appropriate for dieters who do not feel that psychological factors are involved in their ability to control their weight. This may be a very effective program for the many dieters who feel that they are holding themselves back from successful weight loss due to negative thought processes or detrimental habits surrounding their eating behaviors. Beck’s program concentrates on the practical aspects of losing weight and teaches dieters how to prevent self-sabotage by overcoming the psychological barriers associated with weight loss and maintenance.